When your new jersey leaks before its intended release date the team has two options. The first is to acknowledge the leak and put together an impromptu “official unveiling”. 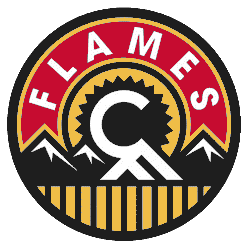 The other option is to do what the Calgary Flames did, which is to stick your head in the sand and pretend that the world has not seen the new design. 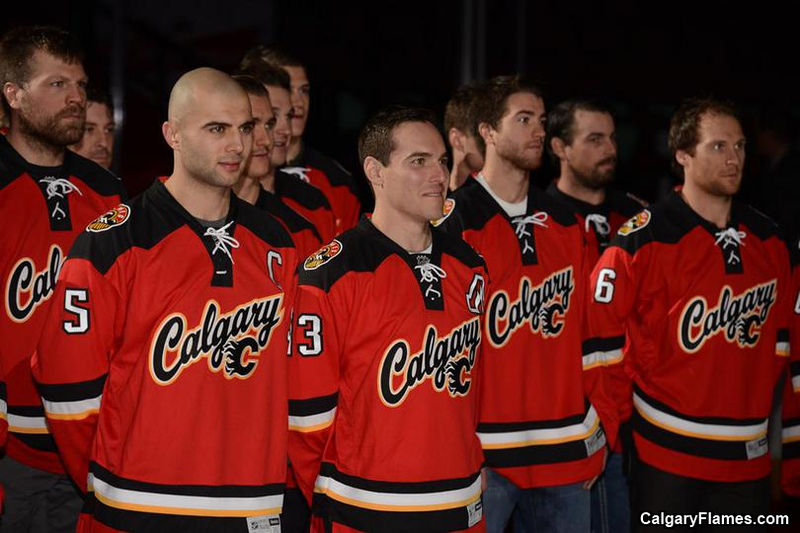 The classic EA Sports video game franchise, NHL 14, accidentally revealed the new Flames sweater earlier this month. The Flames ignored that and started posting teaser images of the jersey through their Twitter account. Most of those tweets garnered responses along the lines of, “we have already seen the jersey”. Either way, the jersey is officially out now. The new Flames’ alternate jersey uses the team’s traditional red. The arm and hem stripes are based on the striping pattern found on the socks worn with the home sweaters. There are black shoulder yokes which have been squared off. A new feature used for the first time on a NHL jersey is the style of lace-up collar. The stitching around the laces is not new, but the fact that it is a different colour than the chest of the jersey is. Teams such as the Maple Leafs, Rangers, and Penguins have used this style lace-up collar before, but the colour inside the stitching has remained the same as the chest of the jersey. The end result is just a subtle stitched look. However, on these new Flames sweaters, the different colour draws attention to the laces in a good, retro way. The primary and secondary logos are also new. The primary logo on this jersey is a wordmark. Typically, a wordmark used as a primary logo is a recipe for disaster (see Anaheim), but in this instance it looks great! The font choice really suits the city of Calgary well. It seems like it could be a logo for the city. The classic flaming C is tucked in there nicely as well. The new should patch is a great piece of artwork. A letter C is front and centre in the sun, but there’s a F which is tilted to appear as part of the mountain range. The remainder of the logo represents the Alberta landscape perfectly. I like that Calgary came up with something new while at the same time they didn’t try to re-invent the wheel. The script on the front is surprisingly good. 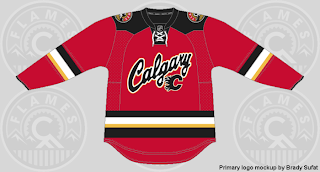 If someone in the Flames organization had said something about a primary logo wordmark before anyone had seen the jersey, assumptions of failure would have been made. The shoulder logo is beautiful and for me is the key feature of this jersey. A very good job from the Flames here.